Dr Josephus Requa (1833-1910), dentist for 53 years and inventor of the first machine gun - Articles de Xavier Riaud - Histoire de la médecine. Dr Josephus Requa (1833-1910), (© John Hyson Jr, 2006). Many people think that the first machine gun invented was the famous Gatlin. However, this is not the case. Here is its story and that of the dentist who invented it. Josephus Requa was born in 1833 in Ulster County, New York. When he was 14, his family moved to Rochester, where from 1849 to 1852 the boy was apprenticed to William Billinghurst (1807-1880), a gunsmith. In 1853, Josephus began the study of dentistry. His teachers were the Doctors T. A. Proctor and Newell Allen. He commenced practice two years later in Springwater, Livingston County, New York. By 1858, he had returned to Rochester and opened a dental office in Suite 903 of the Wilder Building (Hyson & Requa De Francisco, 1999). On June 29 1861, an article was published in the Rochester Daily Union & Advertiser. It reported that Albert Mack, who was employed by the Monroe County Penitentiary, had suggested to Dr. Josephus Requa that the Union army needed a rapid-fire gun. The article stated that Requa gave some thought to the project, came up with a design, and completed it with his master gunsmith, William Billinghurst. On July 11, despite his profession as a dentist occupying the majority of his time, a scale model was finished. After favorable reviews from some prominent Rochesterians, Requa and Billinghurst built a full-size prototype at the gunsmith’s shop. The prototype cost less than $500 to be built (Hyson & Requa De Francisco, 1999). The first machine gun was known as the “Requa Rifle Battery”. It consisted of 25 two-foot-long rifle barrels mounted on a frame secured onto a two-wheel carrier. Its weight was 500 pounds. It also had a cartridge clip that could hold 25 cartridges. One percussion cap fired all 25 barrels in a volley, and three men could reload seven times in one minute, thereby firing 175 shots per minute. The rifle barrel assembly could be raised or lowered for distance. A special feature of the weapon was to spread the gun barrels in a wider horizontal arc, a position which made it easier to cover a wider area. Placed near a bridge or a narrow passageway, this weapon made it impossible for the enemy to pass. The gun was soon nicknamed the “street sweeper” (Kling, 1999). On April 22, 1862, after building and testing the prototype, Requa traveled to Washington, D.C. in the hope of canvassing the Union army and meeting with the appropriate personnel in charge of ordnance procurement. He finally secured an appointment with General Ripley, who summarily dismissed him, explaining that this weapon wasted too much ammunition and that, in this regard, it cost a fortune. Requa refused to accept defeat and met with President Abraham Lincoln on May 1, 1862, by grace of a letter of introduction from Dr Edward Maynard, another dentist and inventor of the first repeater, the Maynard repeater, which was already famous at the time. President Lincoln took charge of the situation and personally witnessed a test of the machine gun on May 12, 1862. The test results were positive (Riaud, 2006). All of this promotional effort was taking its toll financially on Dr. Requa, who had been away from his dental practice for two months. And even after these successful tests, there was no imminent purchase order. Requa and Billinghurst, now short of funds, had to secure venture capital. The two inventors approached Smith and Bradley, two financiers who agreed to appropriate funds for the manufacture of the Requa rifle batteries. From then on, contracts were drawn up for component suppliers, such as Remington (Kling, 1999). 30 units were assembled in Troy, New York by Parmenter & Bramwell and 20 more were made at Billinghurst’s armory in Rochester, under US patent number 36,448. The patent was allocated to J. Requa and W. Billinghurst on September 16, 1862, the day before the Battle of Antietam, one of the bloodiest of the Civil War. The rifle then entered the war. Albert Mack, who meanwhile had become captain of the 18th Battery of the New York Light Artillery, received a few models of the first Requa guns. His unit operated from September 1862 to July 1865, serving in New Orleans, Louisiana; and at Port Hudson, Mobile, and Montgomery, Alabama (Hyson & Requa De Francisco, 1999). 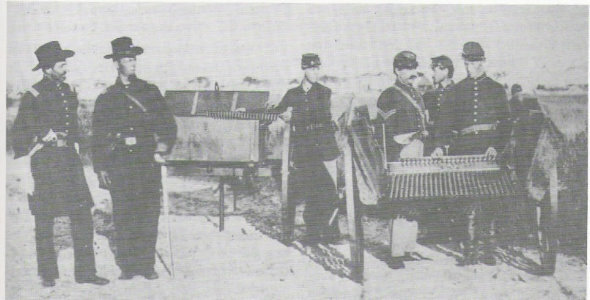 One of the successful achievements of the machine gun was the recapture of Fort Sumter in 1863. It was also deployed at Petersburg and Cold Harbor in 1864 (Riaud, 2006). In 1864, Requa went back to his dental practice. On August 3, 1864, he put up a poster in the Union & Adviser which said: “Artificial teeth can be put in place but the preservation of the natural teeth is to be privileged” (Hyson & Requa De Francisco, 1999). 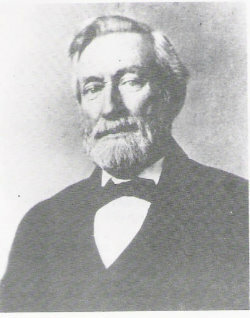 Dr. Requa, who was exempt from the draft as the only child caring for an elderly parent, enlisted in 1864 as a member of the 5th Regiment of the 84th New York National Guard. He was assigned to a Confederate prison in Elmira, New York. He saw duty for just three months, and never considered himself a Civil War veteran. After the conflict, the Gatling gun replaced the Requa rifle battery and was displayed in museums. Dr Requa was inducted as the first permanent member of the Dental Society of the State of New York in 1868. This honorific measure was voted on June 30, 1868 at the congress of the association which took place in Albany. In 1906, the Dental Society of the State of New York and the dental department of the University of Buffalo organised a dinner to honor Requa’s long career. He retired after 53 years of dental practice. Josephus died two years later on November 21, 1910. His inventive mind and perseverance played a significant role in the outcome of the Civil War. Josephus Requa was buried in Mount Hope Cemetery in Rochester. Batteries of Requa’s machine guns ordered by lieutenants Wheeler and Kingsbury, 33rd Illinois, 1863, © John Hyson Jr, 2006. Hyson John Jr & Requa De Francisco Margaret, Dr Josephus Requa Civil War dentist and the Billinghurst-Requa Volley Gun, Museum Restoration Service, Bloomfield, Canada, 1999. Hyson John Jr, personal communication, Timonium, USA, 2006. Kling Warren, « The story of Dr Josephus Requa (1833-1910), a dentist, and his Civil War machine gun », in The Friends of Mount hope Newsletter, vol. 19, n°4, Rochester, 1999, http://www.lib.rochester.edu, p. 1, 2. Riaud Xavier, L’influence des dentistes américains pendant la Guerre de Sécession (1861-1865) [The Influence of American dentists during the Civil War (1861-1865)], L’Harmattan (ed.) Collection Médecine à travers les siècles [“Medicine throughout the centuries” Collection], Paris, 2006.